There’s something lavishly indulgent about checking in to a luxurious hotel with the singular intent to settle in and relax. No early morning wake up calls. No planned excursions. No returning home more exhausted than you arrived. Such was the case recently when my husband and I checked in to Peru’s Aranwa Sacred Valley spa hotel for a peaceful getaway. Based in Cusco for a three-month stay, we’d already explored the nearby ruins at Machu Picchu and the surrounding Sacred Valley of the Incas as part of a Peru walking vacation. So, unlike most of our fellow guests who set off early each morning on various sightseeing excursions, we stayed put: pampering ourselves with soothing spa treatments, gourmet meals, poolside naps and Pisco Sours. 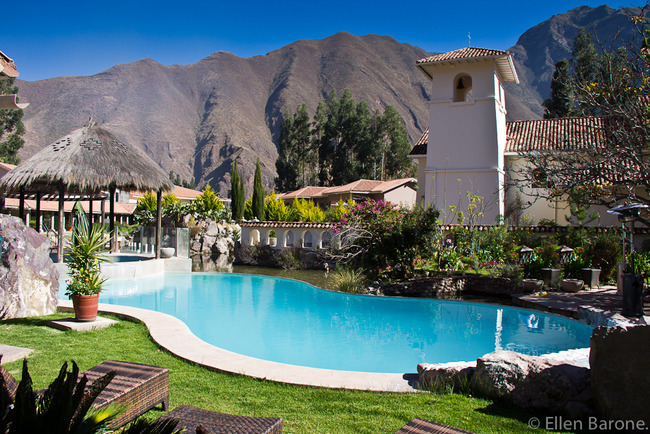 Hidden away in a magical setting an hour-and-a-half drive from Cusco on the lushly landscaped grounds of a 17th century hacienda, the riverside and mountain-ringed Aranwa Sacred Valley hotel is built for leisure. There’s an on-site museum, art gallery, library, orchid house and movie theater, as well as complimentary in-room amenities including wireless Internet, flat-screen TVs, DVD players, plush robes and oversize Jacuzzi tubs. The heart and soul of the serene enclave, however, is the sumptuous 26,000-square-foot UNNO Spa, a healing sanctuary fusing the best of traditional Andean and Inca practices with state-of-the-art wellness technology and luxury. Decorated throughout with local woods, Andean stone and walls of glass fronting the tree-lined Vilcanota River the two-story spa boasts private treatment suites, a wet area with heated hydrotherapy pools, steam baths, saunas and Vichy showers, in addition to yoga and meditation rooms, aromatherapy oxygen (to ease altitude sickness), a full fitness center and hyperbaric chamber. Coming off a bone-chilling winter in Cusco and seeking warmth, I spent my time at UNNO thawing out; floating from one heated therapy to the next. Between the thermal water circuit - a sensuous herbal-infused steam bath, dry sauna and Jacuzzi tub – in a private spa suite and the fiery mysticism of the stone bed ‘Secret of the Andes’ treatment, it was easy to be lulled into a warm cocoon of total relaxation. Peruvian cuisine is a foodie favorite. The dining scene at the resort’s Pukawi Gourmet Restaurant, featuring an inspired blend of local richness and foreign technique, did not disappoint. Try the Taboulé de Quinua con Trucha, a fresh mix of quinoa with vegetables, chunks of smoked Andean trout sashimi with fresh aguaymanto sauce. Or, Pato a la Mandarina, tangerine duck with pachamanca sauce and cheese tamale. Delicious. And, with twenty-plus different Pisco cocktails on the menu at the Kusi Pisco Bar, if you haven’t developed a taste for the national beverage, this is certainly the place to try the popular brandy. A growing Lima-based hotel group, Aranwa offers luxury accommodations and service along with authentic immersion into Peruvian culture and the local destination. The group includes: Aranwa Sacred Valley Hotel & Wellness (opened 2008), a resort located in the Urubamba Valley, and Aranwa Cusco Boutique Hotel (opened 2010), and others under development. The company’s mission is not only to provide superb hospitality and promote guest wellness and health with state-of-the-art spa treatments, but also to seek harmony with the environment and appreciate and respect the local culture. For more information, please visit:www.aranwahotels.com.